The crazy, funny, heart-breaking story of love, family and overwhelming loss which led broadcaster and podcaster Emily Dean to find hope and healing in the dog she always wanted. 'We were an extraordinary, noisy, unpredictable family, but not a dog family. People with dogs represented every aspect of domesticity that seemed right and functional. We represented everything about family life that was wrong and curious.' Growing up with the Deans was a training ground for many things, like ignoring unpaid bills and being the most entertaining guest at dinner, but it was never the home for the dog Emily always craved. Sharing the chaos and calamitous parenting was her beloved older sister Rachael, her rock. While Rachael went on to have the perfect family and treasured dog, Giggle, glamorous Auntie Emily lurched from one unsuitable relationship to another, normality - along with dog ownership - remaining a distant dream. Then tragedy strikes. Rachael is suddenly diagnosed with cancer, and in just three devastating years Emily loses not only her sister, but both parents as well. 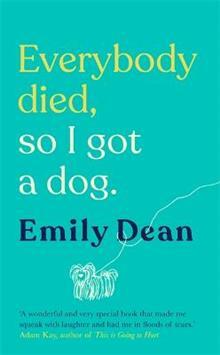 This is the crazy, funny, heart-breaking story of how Emily discovers that it is possible to overcome the worst that life can throw at you, and that 'there is no such thing as ready, there is only now', finally owning her own dog - an adorable shih-tzu named Ray.